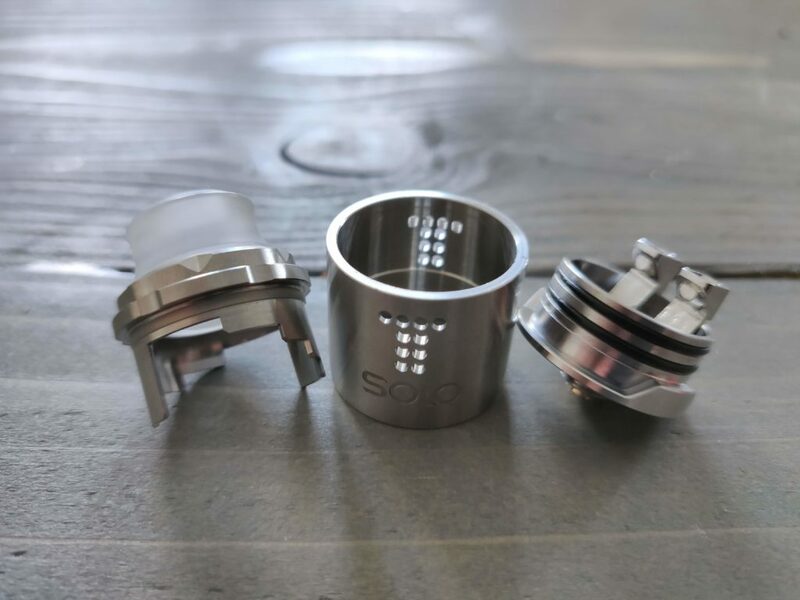 The Drop SOLO RDA is a single coil version of the well-known DigiFlavor DROP RDA. But is it as good as its bigger brother? Single coil RDAs are all the rage right now, and this is mostly down to the popularity of squonk mods (which are mostly single cell units). You can run a single coil RDA at lower power and this, in turn, makes them more useful when used in conjunction with a single cell squonk mod. Less power means more battery life, and everybody’s happy. The original DROP has dominated our Best RDA Guide for almost a year now, so can the SOLO follow up? 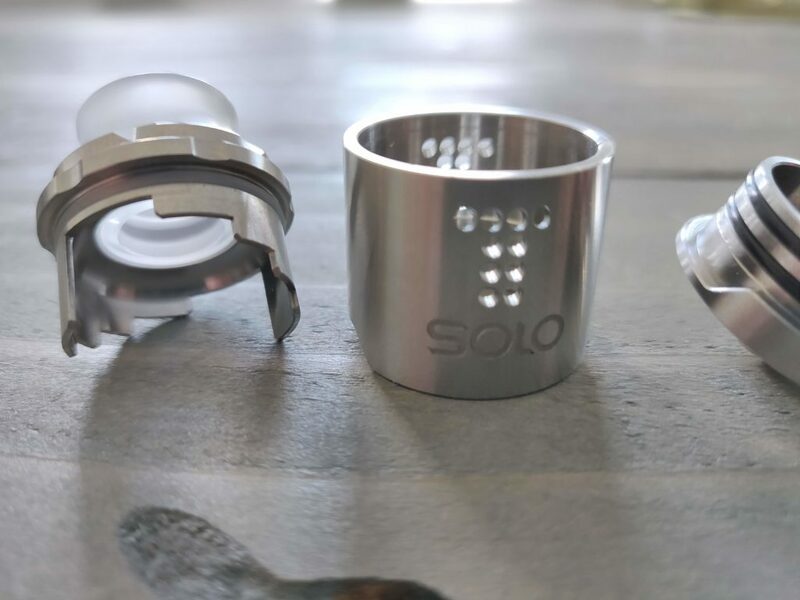 The Drop SOLO RDA is the latest single coil version of a prominent RDA to get released, and I just spent a couple of weeks getting aquatinted with it. What follows are my honest impressions of this RDA, how it performs, and whether or not it is worth your time and money. 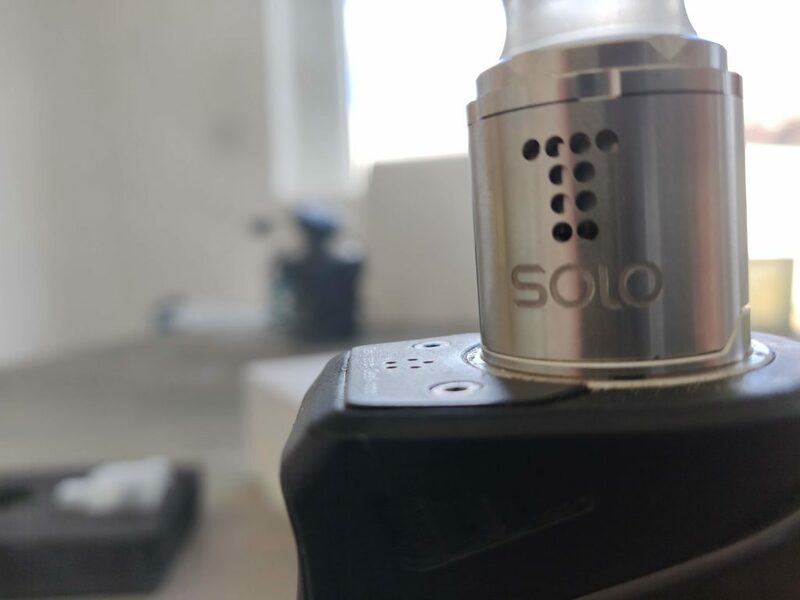 I like the design of the Drop SOLO RDA. It’s nice and neat and extremely economical. There are no superfluous aspects to its industrial design. Everything that is there serves a purpose. The machining, the materials, the way it all comes together and apart are well implemented and clearly thought out. 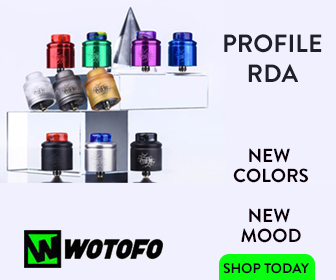 You even get a PMMA top cap included, and this changes the way the RDA performs dramatically. You’re essentially getting two RDAs for the price of one, in this regard – and that’s pretty cool. The DigiFlavor Drop SOLO measures 24mm x 22mm and you have a 5mm juice well to play with. 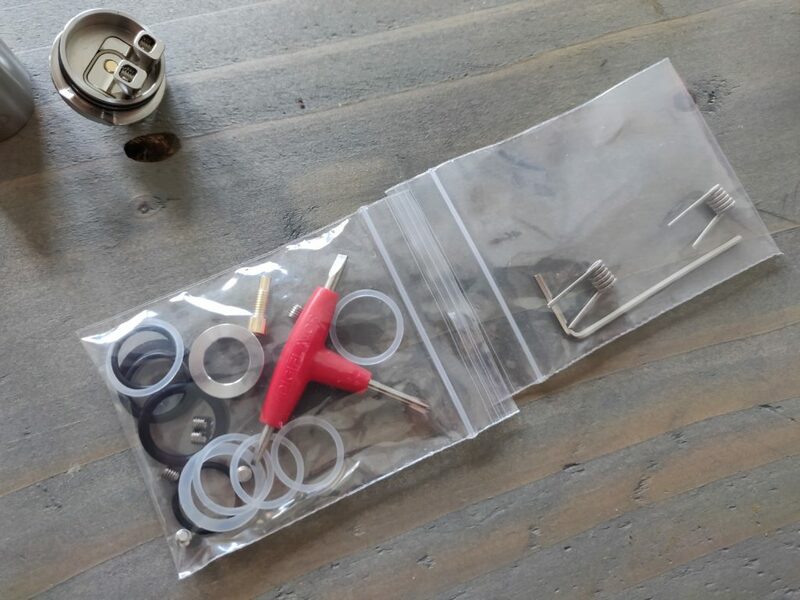 Run it as a squonker RDA, and all you have to do is install the pre-packed squonk pin. The AFC consists of 10 potential air holes, though I wouldn’t advise you use it wide open. During my time with the RDA, it seems to perform best with six holes open. The tank is available in silver (the one I got), black, and gold. I personally prefer the way the black one looks, but that’s just me – gold is also pretty nice too. The drip tip is a standard 810 setup. I didn’t really like the ones that it came with, so I swapped it out for the one from my BONZA RDA and it was a much better fit and gave a vastly better vaping experience. 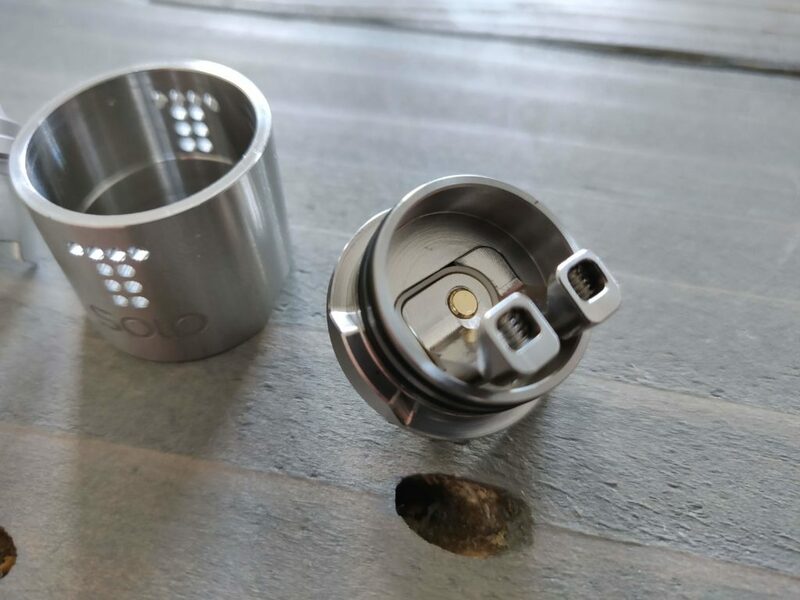 The layout and design of the tank is fairly straightforward: the deck, a top cap, and a drip tip – this makes it an ideal choice for newbie RDA users. Where things get a little more complicated it the actual deck and setting up the DigiFlavor Drop SOLO. You have two, raised and very spacious posts to work with. These can handle two coils as well, though I much preferred to run this RDA as intended (single coil mode). The install of coils is a little different from normal. They go in vertically and you bend them over: this threw me initially, but once you know what you’re doing it’s actually rather simple. The included squonk pin is actually attached to one of the deck’s posts, so when you install it you have to remove and replace one of the posts. Don’t worry, though, a five-year-old could set up the squonk pin on this tank. And it only takes about two minutes. Wicking is as simple as normal; install the cotton, fluff it up, juice it, then re-attach the top cap and start vaping. The screws that hold the leads in place are solid and robust. Once tightened they lock everything in place, so you can adjust your coil height so that it sits in front of the airflow holes. Setup is simple enough, but in order to get maximum performance and flavor from this RDA, you need to get the height placement of your coils JUST right. My first build on the DigiFlavor Drop SOLO was a complete disaster. The flavor was shite and I was immediately not impressed (with myself or the RDA). RDAs, in my view, should be the simplest of ALL vape tanks to set up: just mash some coils and cotton in there and go! The DigiFlavor Drop SOLO requires a little bit of nuance, however, to get the most flavor from it. You have to tinker with the height placement of the coils in order to find its sweet spot. When you get it right, the flavor is great. Miss it by a millimeter and, well… everything goes to sh*t.
The PMMA top cap, however, changes ALL of this. It is far more forgiving and, because of its size and design, seems to give far more flavor than the stainless steel top cap. I REALLY don’t like the way the PMMA cap looks, though, so I had to ensure that I got my coil placement right, as I didn’t really want to use it. I don’t like seeing inside my tanks, all the gunk, and stuff, so while it is nice that DigiFlavor included a PMMA cap, it’s not something that I tend to go for. You also REALLY need to play around with the AFC to get the most from the DigiFlavor Drop SOLO as well. Wide open, well… it’s not great. Odd, I know. But this is just the way it is. The nature of the design means that too much air enters the tank and the flavor gets all wonky. I messed around with a myriad of settings, which you do by twisting the top cap, until I found my sweet spot – six holes. 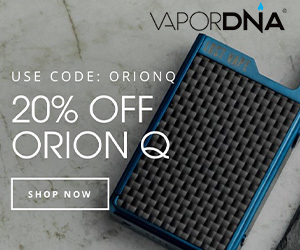 This setting ensures the airflow hits the coils in a controlled and direct manner. You get less waste air in the tank and the result is a more precise flavor when vaping. To be 100% honest, I wasn’t blown away by this RDA. I was expecting BIG things and I found it to be distinctly average in the areas that really matter – airflow and flavor. And the DigiFlavor Drop SOLO’s just ain’t that good. It’s a B+ at best. 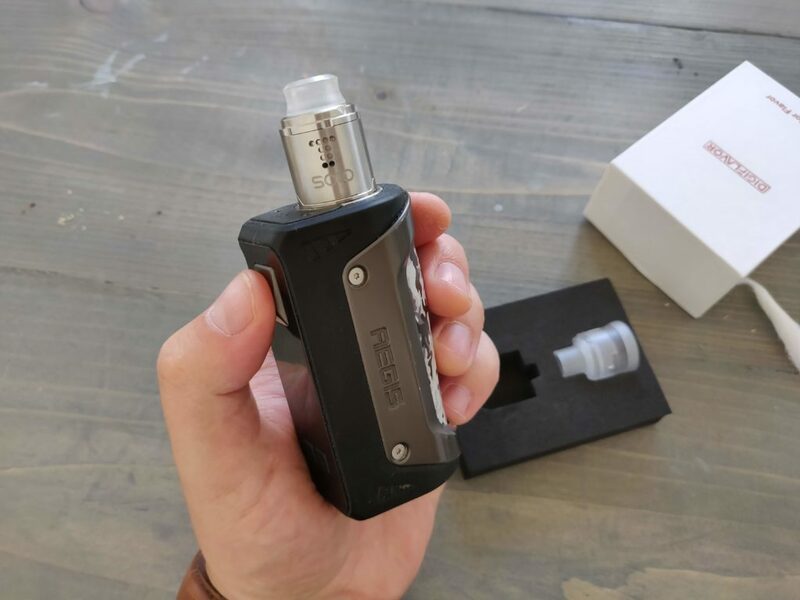 If you’re after a brilliant single coil RDA, I would 100% go with the Wotofo RECURVE RDA over this one. It’s cheaper, better looking, and is VASTLY superior when it comes to flavor performance.